We arrived at the farmhouse, and it was incredibly cool and secluded. Located on the very back of the farm, it had an amazing view of a private beach. As soon as we got out of the car Nolin and I immediately went exploring out the back and made our way to the beach. 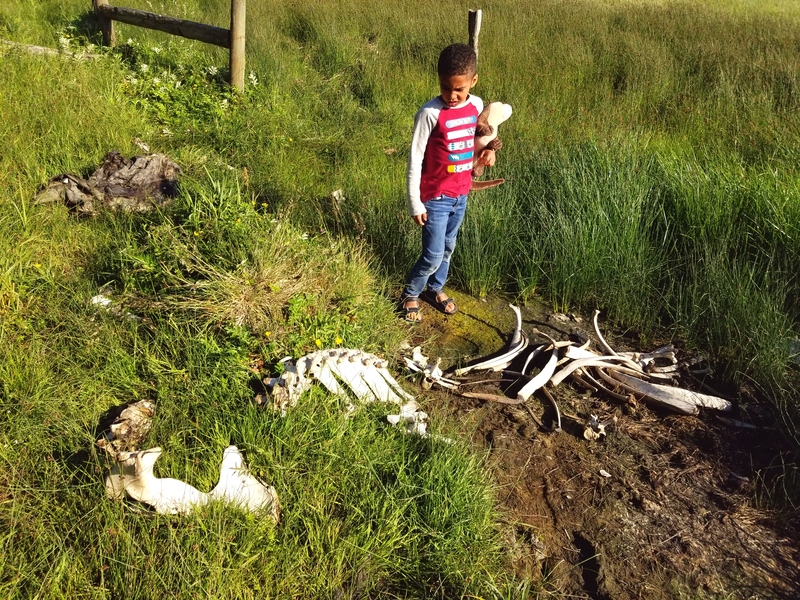 This would definitely be a change of pace, as we were walking out, Nolin and I came across the bones of a dead cow. I started to get a little nervous that we could have found ourselves in a scene from Texas Chainsaw Massacre. Even Nolin, our Adventureman was a little weirded out by the bones, but it was worth the effort. The beach and walk were amazing. Jenn and Grace came and met us a little later (also weirded out by the bones), but we just spent the afternoon exploring and skipping rocks. There is something awesome about going on vacation and being able to simply skip rocks with your kids. One of the things that Jenn and I had been looking forward to on this leg of our trip was dinner at this nice restaurant overlooking the ocean. We walked in and immediately realized that this was not the place to bring kids and enjoy our meal (or allow anyone else to enjoy theirs). So we went to the next best option a Swedish fish & chips restaurant…it ended up being perfect…and Grace lost her 2nd tooth. This time she didn’t swallow it. The house did not have all of the comforts of our previous Airbnb, but it did offer a unique and amazing experience for our family, including a few horses that the kids loved and some amazing nearby sites to see.